The state of Gujarat is well known for the Garba, the amazing food, the Rann of Kutch, the vibrant clothes, the rich culture and. . . wait for it . . . dinosaurs! Don't be surprised as the state is one of the few locations in the country were one can find a huge treasure of dinosaur fossils. 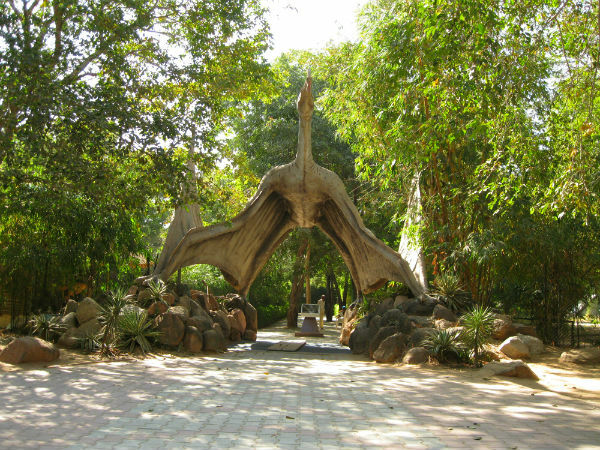 The Indroda Dinosaur and Fossil Park located in Gandhinagar is home to the world's second largest hatchery of dinosaur eggs. The park was set up by the Geological Survey of India and is the only museum of dinosaurs to be found in India. Run by the Gujarat Ecological and Research Foundation, the park is also called India's Jurassic Park. The fossils housed here are from the later Cretaceous period. The Forest Department of Gujrat began the work of plantation in the year 1970 and today it is one of the most attractive man-made forests in the country. The park is spread across an area of 428 hectares of land and has various sections in it apart from the dinosaur and fossil section; one can find sections dedicated to mammals, avifauna, reptiles, earth, marine, plant and also a botanical garden. The place also has numerous life-size statues of the dinos along with the period in which they lived. The eggs seen here are of various sizes and shapes, beginning from what looks like eggs of ducks to the ones which look like a cannon ball. The eggs tend to weigh more than a fully-grown human and takes you back 65 million years, the area could have been a much loved place by the dinosaurs to spend their time. On display here one can find the dinosaur species like Tyrannosaurus rex, Megalosaurus, Titanosaurus, Barapasaurus, Brachiosaurus, Antarctosaurus, Stegosaurus and Iguanodon. The fossils were found at the basins of Songhir Bagh and Himatnagar of Balasinor and also in the southern parts of Kheda, Panchmahal and Vadodara districts of the state. Keeping the fossils aside, one can find various animals and birds like deers and peacocks moving around the place on the banks of the Sabarmati river. Visitors are welcome to click pictures of the eggs but are not allowed to touch them. One can also find life-sized models of the dinosaur which once freely roamed around these parts of the globe. The nearest airport to Gandhinagar is the Sardar Vallabhbhai Patel Airport in Ahmedabad, which is located at a distance of 27 km from Gandhinagar. The nearest railhead is the Ahmedabad station which is located at a distance of 27 km from Gandhinagar. The place is also well connected by roads from various cities in and around Guajrat. October to March is the best time to visit the park.